Good morning! I have a couple of Fall card swap cards to share with you today that I recently created with my Peachy Keen Stamps. A fellow member of The Peachy Keen Connection hosted a Fall card swap over there, and since Fall is my FAVORITE time of year, I signed up for two spots. Here are the cards I made. I chose to do one Halloween card, and one Fall card. For my Halloween card, I used a tag from a recent Stampin' Up! purchase. They had a great card kit available that I thought would make quick and easy cards, and while I missed my stamp club meeting for that month, I was delighted when I found that the card shared for class was made with the kit I had chose to purchase. THAT meant I had a sample using the card kit, and that's the layout I used for this card. I'll give my Stampin' Up! demonstrator, Nancy Williams credit for this brilliant layout. I used the spider and sentiment from the Nikkity Knack Cat Gang for the printed tag, and I added some small googly eyes, which I thought would be a cute touch. 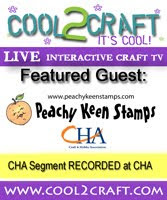 The "Have A Peachy Keen Halloween" sentiment was a free stamp that Peachy Keen Stamps gave out a few weeks ago during one of their fabulous sales. Lucky shoppers were treated to this stamp with each order placed. I hope YOU were one of the lucky shoppers! 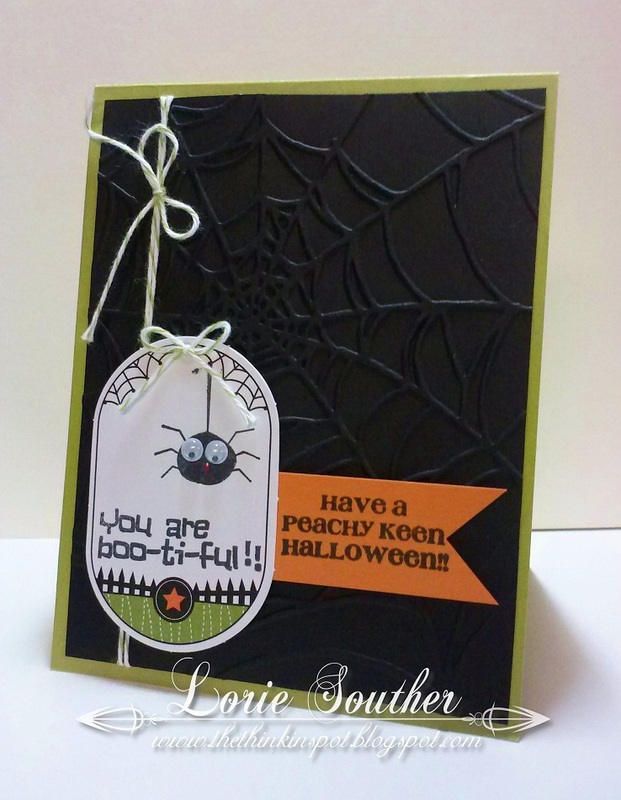 The card stock and spider web embossing folder, as well as the twine and tag all come from Stampin' Up!. When thinking about my Fall themed card, I knew exactly what paper I would use. I just got this great paper from Stampin' Up!, and I got it solely for this card swap. Thanksfully, there's so much in the package that I have plenty for other great projects, too. The AW SHUCKS sentiment and the adorable little ear of corn come from the PK-292 Faceless Corn stamp set from Peachy Keen. I LOVE that "toothless" grin that is included in this set, and I always get a kick out of using it. Seriously! How can you look at that face and NOT smile. It just can't be done!! I kept the embellishments very minimal for this card, because I wanted the paper and that sweet image to shine. I hope your Monday is off to an AMAZING start! It's gonna be a GREAT week, so happy stamping to ya! Great cards! i always adore your work (he he)! I hope you have an a-maize-ing week too! SA-WEET! 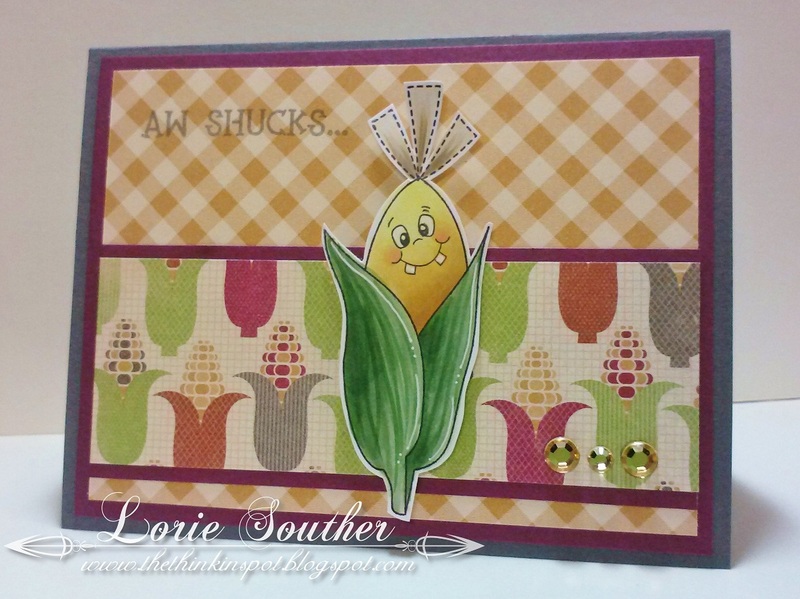 Love that aw shucks sentiment with the corn!! TOOO CUTE!! Love ya! Thse are both great cards! The web and googly eyes are perfect on the first card. The image on the second one made me giggle. Love the colors and how you placed it. These are super adorable Lori!! You always create the best cards!! Both cards are wonderful but my favorite is the first ! Love the embossed spiderweb. adorable, i really like the web embossing!! !